In our lives we occasionally come into contact with someone or thing who is toxic for us. An invasion into our lives that brings nothing but pain and misery. It could be a lover, your boss, or even drugs. It could even be someone you knew was bad news and yet you kept being around them anyway. The Devil tarot card is a herald of this terrible influence in your life, and with its awareness is your ability to remove it. 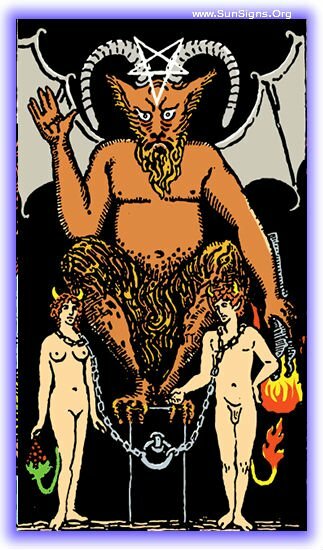 Find out more about the meanings of the Devil card in the upright and reverse positions. This Major Arcana card appears as a warning in your life of someone or thing that is riding you, that is influencing you in negative ways. You may be aware of it, but still persist with it. With this alarm bell, it is time to identify them and cull them from your group. There has been someone in your past who has been driving you to poor decisions, the only bright point in this card appearing is that this person appears to be moving out of your life. It is left behind and abandoned. This person may not be a person at all, this could signal the end of a drug addiction, or the abandonment of an abusive partner. Look around you, things are not as you dream it to be. You have a monkey on your back, it’s driving you forward and making you make decisions you otherwise wouldn’t. Take caution, step back, look around, and choose whose advice you listen to carefully. This poison will consume you if you let it. Beware traveler, the future holds a devil in its midst. Alerted, you may be able to avoid its coming, and avert it out of your life. It is possible, however, that it will arrive in a hidden fashion, and you won’t know that this influence is foul until it’s already inside. Either way, being alert now will help you avoid it. 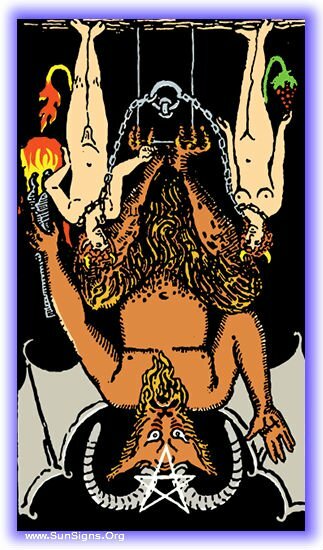 The Rider Waite tarot card in the inverted position is, if anything, darker than its upright version. When this shows in your reading YOU are the poison. You may not be aware of your own actions or how they affect others around you, or you may be quite aware and just not care. Karmically, it’s not a good place to be, and it’s a call to change your behavior. In this one position this card can be a decent thing, you’re moving past your toxic ways, no longer infecting those around you. It is hopeful that if this card arrives it is due to a realization on your part and not merely the removal of anyone to manipulate. Take caution going forward. You may not be aware of it, but you are the monkey on someone’s back right now. Your ways, even if you are trying to help, are serving as an emotional sickness for someone else. It could be a child always trying to please you, it could be a coworker whose work is never good enough. This card appearing is a call to stop your actions. In the future you will be in danger of falling into a habit of oppression or controlling behavior. You can’t see it yet most likely, but it could be a response to stresses not formerly present. Be aware and steal away from this path, no one needs this kind of mark on their soul. Previous What Is My Lucky Car Color?